of the trolling motor, allowing longer range for kayaking and fishing. The data is based on the motor using a 12V 75AH Deep Cycle Marine battery. with 1 person in an 12 ft kayak. 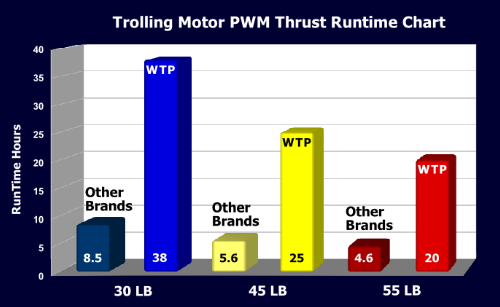 The chart shows the speed and run time of other brands and then the same speed and run time using PWM models. The data for the 45 lb and 55 lb motors are extrapolated from a 30 lb motor. Cable Controller unit with variable speed control and auto detect forward and reverse control. Controller pot center detent stop On/Off. Pot turn right, = FWD Mode On, unit goes to Idle from center detent auto detect FWD Motor Run speed setting from 0-100 %. Pot turn left, = REV Mode On unit goes to Idle from center detent auto detect REV Motor Run speed setting from 0-100 %. Pot center detent stop = Off. Current 0-46 amps max. / Current 0-56 amps max. Power module for 46 lb / 56 lbs electric trolling motors. Efficient New Design H bridge FET power train. Power module with current overload sensing. The unit is set at 46 amp or 56 amp current overload. Once the system goes into overload the motor will shut down, and can only be reset when the throttle is in the off position. After a shutdown the throttle should be advanced slowly to make sure the cause of the overload is removed. Do NOT clean weeds or debris from the prop with the motor active. A PWM will not have the same power savings when set at full speed; since the FET power train is by passed to deliver as much amperage to the motor.